I can highly recommend buying yourself a silicon mini bundt mould! 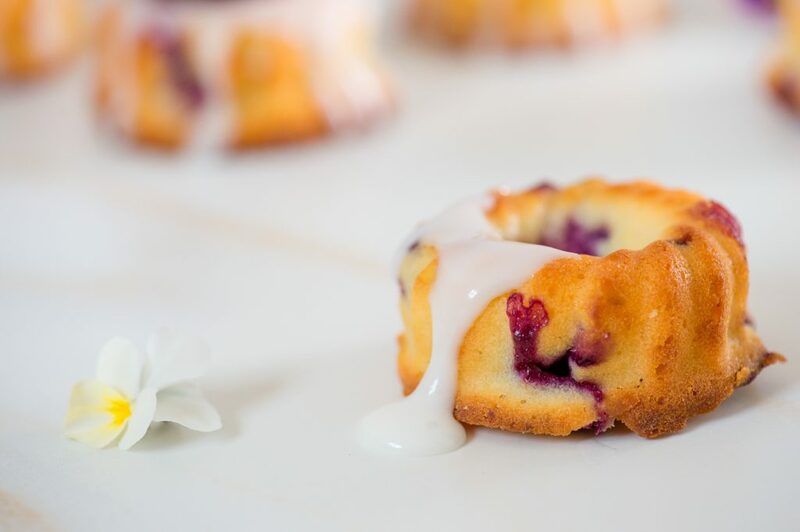 Not only will you be able to make these adorable Lemon and Blueberry Mini Bundt Cakes, but many other delights too. These moulds are great for mousses, panna cotta’s, jellies and cakes of all kinds. Having said that, although they may lack the cute factor, this mixture works just as well when baked as cupcakes in a muffin tin. 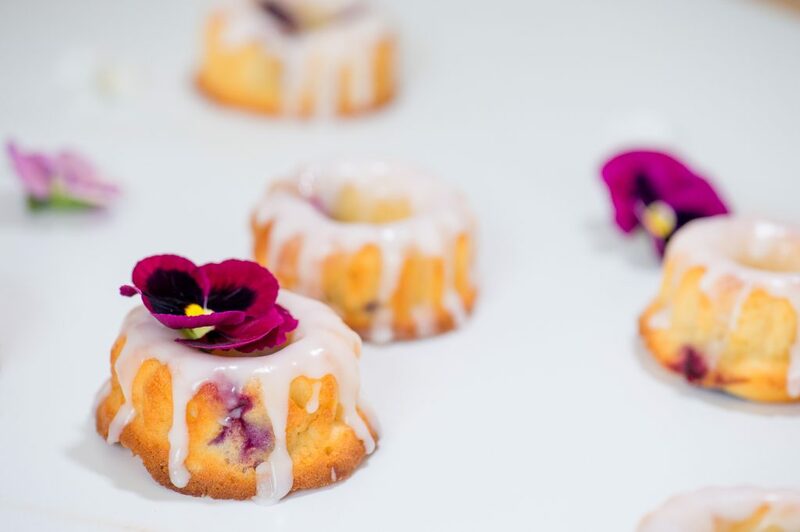 What’s great about these little cakes is the soft, moist texture and zesty lemon freshness. The blueberries bring heaps of flavour to the table, as well as adding the gorgeous purple pops of colour. I actually prefer the cakes without the glaze as I find them sweet enough, but I must admit the drizzle of glaze looks really pretty and lifts the lemon flavour beautifully. Preheat the oven to 180°C. Spray a silicon mini-bundt mould with cooking spray (or use a muffin tin). Cream togethre the butter and castor sugar for 3-4 minutes until light and fluffy. Add in the eggs, one at a time, beating well after each addition. Beat in the vanilla and lemon zest. Sift together the flour, salt and baking powder in a separate bowl. Stir the yoghurt, milk and lemon juice together in a jug. Alternate adding the dry ingredients and yoghurt mixture to the creamed mixture, working with about third of each at a time and mixing well after each addition. Lastly, stir in the blueberries gently – stir only a once or twice. Immediately spoon the mixture into the moulds, filling about ¾ full. Bake for 18-20 minutes, or until a toothpick or skewer inserted comes out clean. Leave to cool in the moulds for 15 minutes, then unmould onto a cooling rack to cool completely. 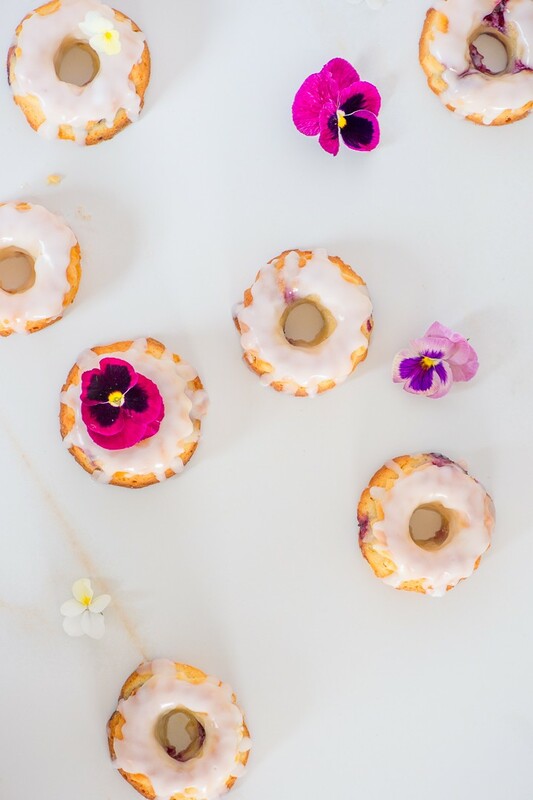 Meanwhile make the glaze. Sift the icing sugar into a bowl and stir in enough lemon juice to make a thick icing. 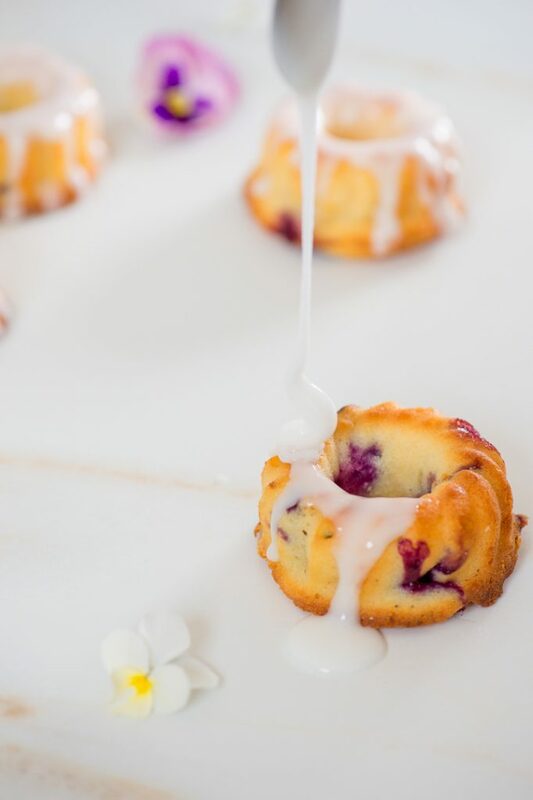 Once the bundt cakes have cooled completely, drizzle the glaze over and leave to dry before storing in an airtight container. the cakes will keep for about 3 days at room temperature. *If you are using frozen blueberries, do not defrost them before using, or they will become very juicy and colour your cakes purple! If you can, keep them in the freezer right up until you need them. The flour coating on the blueberries prevents them from sinking during baking.